Please find Action OHS Consulting’s February 2016 edition of our 4-monthly newsletter Building a Safe Workplace Together. 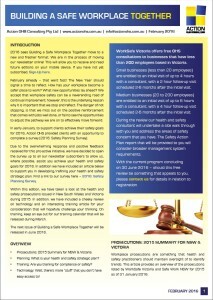 In this edition we have reviewed the Health and Safety prosecutions listed by WorkSafe Victoria and Safe Work NSW for 2015 as of 31 January 2016, providing an overview of: (i) number of prosecutions, (ii) average and median fine amounts; and (iii) with the criteria/code attached to the prosecution. The criteria/code makes for some interesting reading and will guide the articles we present in future newsletters. In addition we have looked at strategic planning for safety; ask the question, are you training for compliance or safety? and review the role OHS Software is playing in today’s workplace.